Torrid conditions were expected to last through Saturday before easing a bit Sunday. The heat was being produced by a "humongous" dome of high pressure that was also spreading oppressive conditions into parts of Arizona, Nevada and Utah, the National Weather Service said. "Today will be one for the record books," the Los Angeles region weather office said before sunrise - and within a few hours records began to fall. In downtown Los Angeles, it was only 10:15 a.m. when the mercury topped the July 6 mark of 94 degrees (34.4 Celsius) set in 1992 and kept on rising, hitting 100 (37.7 Celsius) before noon. Many other areas were sweltering in record triple-digit temperatures earlier. The offshore flow of air pushing back the normal moderating influence of the Pacific Ocean produced startling early morning temperatures: Many Southern California locations reported temperatures above 80 degrees (26.6 Celsius) before dawn. At 3 a.m., it was 98 degrees (36.6 Celsius) in Gaviota on the Santa Barbara County coast about 125 miles west of Los Angeles, the weather service said. Maximum temperatures were predicted to be 20 to 25 degrees above normal virtually everywhere. The Woodland Hills area of Los Angeles, for example, was forecast to reach 117 degrees. While beaches offered relief from the furnace-like conditions, forecasters warned that a lingering south swell from former Hurricane Fabio would continue to combine with a local northwest swell to produce dangerous rip currents and the possibility of sneaker waves. 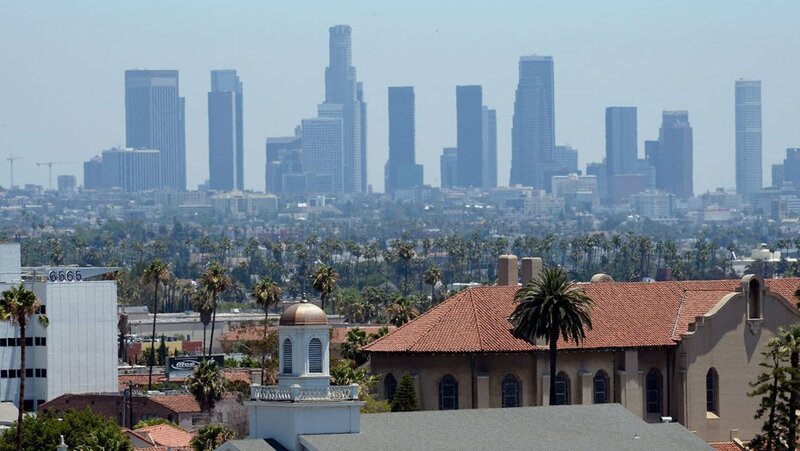 Residents toughing it out in the valleys around Los Angeles and in the inland region to the east faced the possibility of unhealthy air quality. Air pollution regulators said the conditions were likely to produce an atmospheric inversion that would increase ground-level ozone, which is linked to a host of respiratory troubles ranging from trouble breathing to asthma attacks. Firefighters jumped on several brush fires, quickly stopping two in Los Angeles County, while a third grew to 100 acres (40.4 hectares) in Cajon Pass in San Bernardino County. Authorities reported good progress in preventing threats to structures. The highest fire danger stretched from Los Angeles County westward into several counties up to the coast where a north wind added another element to the mix of hot, dry air and parched vegetation. Elsewhere, the fire risk was characterized as elevated. An additional threat was likely to develop by Sunday with the arrival of seasonal monsoonal moisture and the possibility of thunderstorms. "Any lightning strike is going to be a concern," said Alex Tardy, a meteorologist with National Weather Service in San Diego.